A report from CIRP (Consumer Intelligence Research) suggests that of all the Uncarrier phases working best, it’s Jump! giving T-Mobile the edge over its competitors. Combined with the separation of airtime and phone costs, it’s helping Tmo keep hold of its customers, and attract more from other carriers. As a result, T-Mobile is keeping hold of a far higher percentage of its current customers than any other carrier, while simultaneously, attracting more from other carriers than are switching to them. In the long run, that’s a strategy that virtually can’t fail. As for changing the industry, that’s working too. Jump – of course – kickstarted a chain of reactions from its competitors, all of whom started offering their own versions of the plan, giving customers the chance to upgrade earlier than the two-year contract used to. 18% of Sprint customers, 13% of VZW customers and 16% of AT&T customers have taken advantage of their carriers’ early upgrade plans. We’ve all heard John Legere talk about his main aim with Uncarrier isn’t just to provide stiffer competition to the other carriers. It’s about changing and industry that’s “broken”. From this recent research, it would seem like it’s working. ← LG G2 dropped to $499, some upgrade customers seeing it at $403? T-Mobile FTW! Were still not done yet. We still need to work on coverage and obtaining additional low frequency spectrum. I, for one, am looking forward to making my first JUMP! within the next week or two. What are you JUMPing to? give the nexus 5 a serious lookover if you haven already. ive used everything we have in here. the voice recognition is so strong i could ask google stuff with a blender running 3 feet away. 1. The Nexus 5 is such a great price through the Play Store that if I went with it I’d rather buy it outright and not waste a JUMP! on it. 2. For the same screen size as my XZ1 (it’s close enough), it just seems like a waste of $ in my opinion. 3. I like the idea of “different”. I’m really interested in the ergonomics of the curved phone and want to try it out. I also like that it’s a 6″ screen without “seeming” like it is. You are a worse tech junkie than me my friend. You need one if you go through phones that quck. The best part of JUMP is that you’re basically just paying insurance with the ability to trade-up. Its win-win. I wonder what percentage of Tmo’s customers are enrolled in Jump. As of January 18th I am! I know a lot of people were all for it, but it doesn’t work well for me. Great option, but I prefer to purchase the phone in full and resell it. I’m utilizing both options. JUMP! will just help me in between releases of the phones I want outside of T-Mobile. What others are you looking at? Panther Lady, I’m feeling awfully tempted lately. I really love my G Pro, but a few devices are tempting me. Only problem is that they’re so darn expensive (namely, Z1s and One Max). I usually flip my devices, since I don’t (yet) have JUMP! (I just put them on eBay and do the best I can), but I knew that the resale value of my G Pro would be limited. Now the price of a *NEW* G Pro is $369.99. I paid $419.00! The G Flex doesn’t really impress me, since I already have an LG*; however, I feel attracted to the HTC One Max because of the fingerprint scanner, front-facing speakers, and metal body. Yes, the Sony is gorgeous and superior to the One Max specs-wise, but the speaker placement has become increasingly important to me. Another strike against the One Max is that I question if it’s actually better than my G Pro. I’d hate to downgrade. So, I am torn. *Note: I really like LG devices. Yet, I am stunned that LG has still not updated the G Pro. I think my JB 4.1.1 is causing some upgrade fever for me; I look at the Z1s and One Max with at least 4.3 and wonder why that can’t be me. Not sure I want another LG for that reason. By the way, sorry for the duplicate post. Tried to move it to a more appropriate thread. Oops. Aren’t the speakers on the LG G Pro on the bottom, just like the Z1S? No… On the back, next to the camera, facing away from me. I have a Google Nexus 10, and it’s wondrous to have the sound aimed toward you. Ok, gotcha. I tried looking it up at 4 something this morning. I was un-caffeinated at that time. LOL I didn’t like the speaker placement on the XZ so it was an improvement when they put the speaker along the bottom on the XZ1 (and XZ1S). I really wish it would become standard to have the speakers on the front. Not sure how the camera on the HTC One Max is or how important it is to you but it looks like you’d be going from a 13 MP camera to a 4 MP camera. Thanks for the advice. Yeah, with the G Pro 2 around the corner I might just wait and be content. Apparently the Max’s camera is an “”Ultrapixel” camera, but I’m not certain that it’s worth my time. Camera is arguably the most important function for me; the XZ1S just really blows it away in that regard. :-D You’re the best, Panther Lady! Same here. It just shows the other’s numbers. At the very least we’re at 19% beating AT&T which is second. With tax season rolling around here in the US they will probably have a lot of people JUMPing soon. Hopefully consisting of a whole of ATT & Vzn defectors!!! Jump also benefits the manufacturers, cause people will be buying more phones! My jump is coming up next month. I was actually thinking about going from the Note 2 to the Sony Z1s. Anyone think this is a smart move? I mean I like the idea of having a better camera… anyone know if the Z1 and Z1s share the same cases or are they totally different from eachother? I think one thing I will miss is the removable battery. Plus if I do switch I’ll save a few bucks a month. Anyone know if the ZS1 takes full advantage of the 20×20 LTE? I know the Note 3 does, which was also a thought to jump to, although I would end up paying more per month. I also figured I could use my next Jump on the Galaxy S5 or the Note 4. Hhmmmm…. Anyone? I really am curious if this phone will take advantage of the faster LE speeds. Considering I live in Las Vegas, I am sure they will offer the 20×20 LTE soon if they haven’t already. I just traded my note 2 for the z1s and could not be happier. As for the case yeah they are the same I ordered a z1 case on ebay and it fits perfect and yes it also supports the 20+20 lte network that’s why t-mobile wanted plastic not metal around the phone. Awesome, thanks for the info. One thing about the case though, I heard the headphone jack on the Z1s is in a slightly different area than on the Z1, so can you still access it with your case? I was actually thinking of picking up the Ballistic case since they seem to make one for the Z1 and since I’ve had good luck with their cases in the past. Yeah your right about the jack.The case I got is universal, has 2 openings works on either or. Sry didn’t think about that when I posted. If tmo can get the lumia 1520 then I’ll JUMP on that! Either way you’re paying full price. ATT has tightened it’s grip on phone unlocking. Your choices are get an international model (no LTE) or somehow get an ATT unlocked (no Qi). When I wanted to see the two-year contract model end in the US, I didn’t want to see a “lease” type of program replace it. I think that these types of programs still work against the consumer. One of the main problems has been the high cost of devices. There are some lower priced but still capable phones that have come to market, but I had hoped that it would be more prevalent by now. It’s optional though. 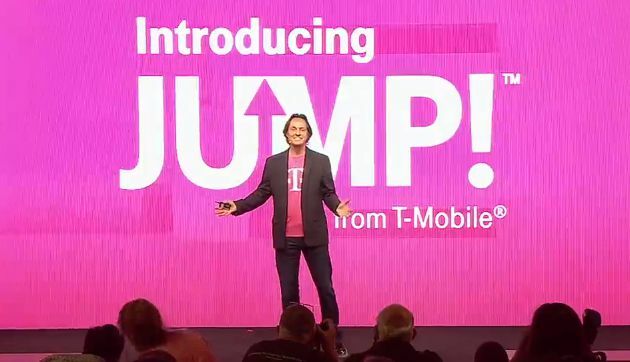 I would never sign up for JUMP because I stand to make more money every year by selling my own phone over what T-Mobile pays for it. But for those who feel like they have to have the latest phone every few months, it works without them having to actually wait the full 2 years or deal with Craigslist/eBay. Make no mistake, T-Mobile is happily making money off this. By keeping people in an EIP/JUMP cycle, they know they can retain those customers. It’s the consumer’s own choice though. Me? I bought my phone outright and enjoy my rate plan just being the $70/$30/$10, and this same phone will likely be resold for $450-500 this fall when I buy a new one. So don’t lease it. Just buy it. If you want the contract model to disappear then the subsidy is leaving too since nobody is willing to pay for some of your phone for free. Just buy the phone outright. Plus then you aren’t limited to what devices T-Mobile carries. Just remember that nobody’s giving you something for free in the world. You will always have to pay for the phone’s full cost; whether through contracts, leasing or buying up front. I’ve been buying phones outright for some years now. I don’t think that you understood my comment. The lease model can be appropriate for some people – can’t manage their money well enough to save, credit issues, etc. But regarding the lower prices, I think as this shift to removing subsidies becomes more universal, we’ll start to see that happen. More transparent pricing will help the market drive down pricing. While I understand your point, I’m not sure the carrier can do much to address it in the short term. It’s still the market’s willingness to pay premium prices for smartphones which is keeping device prices high and going higher. You must have seen my point made repeatedly that the carriers have been paying upwards of $430-$450 for top end devices since the first days of the Vibrant. They’ll be paying over $500 now. It doesn’t give them much opportunity to bring good devices to their customers without some kind of downside. If you’re not going to subsidize and recover using fattened service charges and ETFs, then the user has to pay full price, whether in one payment or installments. TM has started to bring in some passable cheaper devices because they have to sell smartphones to that part of their customer base who are entrenched feature-phone users, but as long as the experienced smartphone users are willing to pay twice or three times as much for ever-improving hardware, the budget devices will always look weak in comparison. At some point, maybe, a significant number of people will stop making that comparison and recognize that the low-end of the market is functionally strong enough to meet their needs and will start buying those devices – perhaps turning them around on an annual basis without having to pay for a Jump! program. I agree that the carriers probably won’t do much to address this in the short-term. My problem with programs like JUMP! is that things won’t change in the mid-term either. Personally, I don’t think that these programs will make it to the long-term. The popularity of these programs proves that the overall market doesn’t want to pay $600 for a phone. The installment programs allow some people to put off the reality of the real price of the phone. If no installment programs existed, people wouldn’t buy the same phones that they enthusiastically got on the JUMP! program because they are suddenly too expensive. Practically overnight, the Moto G, the Lumia 521, and the Nexus 5 would become T-Mobile’s most popular phones. Over a couple of months, Maxwest would probably be the household name that HTC is. Over a year’s time, Samsung, HTC and LG would respond with lower-priced mid and high-end models of phones. There would still be a market for premium phones, as well. This is just part of why I say that the installment programs don’t help the consumers. Without them, device prices would drop faster. As it is now, people still pay high prices for phones. I was actually surprised by this article’s claim that Jump! itself is a key retaining feature. I could believe it of EIP, but Jump! to me seemed like a sop to the vocal minority who wanted regular upgrades, but more importantly, a future buffer against the rapid rate of change in available spectrum that we can continue to expect over the next two years. I’m still not sure that the researchers haven’t confused EIP with Jump! in their analysis. I think we are saying much the same thing, that the key to reducing smartphone prices is developing a critical mass of people buying the cheaper models. My suggestion is slower, but is beginning. Unfortunately, abandoning purchase assistance programs entirely would be suicidal for a company like TM. We already know that their target demographic has a limited disposable income, so presenting them with a single alternative of either paying $600+ per device outright, or buying cheap devices, will force most of them with experience of the top end devices to go to a different carrier still operating subsidies or an EIP, in order to exercise a wider choice. While I might be able to afford to buy a phone outright, I’m less inclined to pay $2,000+ outright for my family’s needs. I might then be pressed to move on, even though I am not in their primary target group. I agree with you that it could be suicidal if T-Mobile did it alone. My line of thinking is industry-wide, since AT&T and Verizon Wireless both have frequent upgrade/no-interest financing programs. I wondered if the article’s author or Mr. Levin confused JUMP! with the regular EIP program, as well. From what I see on the forums and this blog, it seems that there are people who enrolled in JUMP! that don’t plan to actually do frequent upgrades, but took it because the JUMP! fee is lower than the insurance fee that they were paying anyway. Maybe there are more people on JUMP! than I thought there were. But AT&T and VZW still do subsidies, I think. They would have to drop both traditional subsidies and their upgrade finance programs to level the playing field. The only way I think that there can be a significant number of Jump! subscribers is if others experience what happened to me when I got a new phone recently at my local store. We didn’t discuss Jump! at all, but I was somehow enrolled in it when I got the confirming paperwork about all the changes that had taken place. I did an EIP, just to see how it worked, but I made a larger than necessary downpayment, which would have worked against the full benefits of the Jump! program, if I’d actually wanted to enroll. There was certainly no mention of signing up for Jump!, in fact the paperwork I signed explicitly stated that Jump! was a separate program with its own subscription. It was simple enough to cancel the enrollment, but I shouldn’t have had to do it without explicitly signing up in the first place. I think that your experience is too common, unfortunately. There was a time before JUMP! that I went to a store to buy a phone. The rep had her “Right Fit” form and was going through it. When she asked me about insurance and I declined it, she had to cross out the “Yes” that had already been checked on the form, but failed to check “No”. When she gave it to me for me to sign, she had a long wait to get it back. I took my time and checked “No”, then wrote a nice long note to explain what happened, what should have happened and how I felt about it. That rep still doesn’t like me to this day. I can see why people would get the Jump program confused as a “lease program”, but it actually is far from it. The Jump program is an owner finance option, that gives you the guaranteed buy back amount of what ever you owe. Unlike a lease, there isn’t a balloon payment at the end of the terms, and if you didn’t want to trade it in to get a new one, you can continue to pay off your phone over the 24 months and keep the device. There are no interest or finance charges, and I think it helps rather than hurts the consumer. Most also purchase insurance on their device so that they do not have to drop another $600 out of pocket to replace it. To most, the Jump program is the best option because it removes the hassle of selling your device on craigslist or eBay, and to many, they can’t afford $600+ out of pocket for a new device. Over 6 months, customer usually pay only 4-5 payments on a device because the first payment usually arrives a month or two after their first bill. When I got my phone, my first payment wasn’t until march. That means that I will make 4 payments of $25 = $100 total spent in 6 months. I will sell my device back to T-Mobile for $500. Even subtracting $60 for 6 months of Jump that most like to calculate in the equation, I still have $440 left, AND my phone was protected. Some who pay full price for the device and not add Jump, run the risk of damaging their device, and the getting nothing for it. If I sold my device on craigslist, some phones may fetch $500 but good luck trying to get $450-500 for a used Sony Xperia Z or LG G2. In that case, Jump would have allowed the customer to come out on top. I question your use of the word “most” in two places. I don’t have any data on how many customers have insurance, but I don’t think that over half of the customers have insurance on their devices. As I said, I don’t have the data so I could be wrong. The JUMP! program being the best option for most customers is definitely an opinion. At best, the regular EIP program is an option for customers. But the $10 fee for the JUMP! program doesn’t make it good for the customer, it makes it good for T-Mobile. Isn’t it ironic that by removing contracts and setting customers free, a carrier actually retains its subscribers? Here in Cincinnati, T-mobile is spectrum starved. It is not as fast and the “big two” but not the slowest among the six carriers either. Sprint now has LTE here, and I am very tempted to try those carriers with LTE. But then, it is at the expense of signing a contract (or buying a new ugly phone in case of Cricket which has no LTE). At the end I stay with T-mobile. About the “revolution”: I don’t think it is a revolution. No-contract and byod has been in existence around the world for a long time. It is only recently that T-Mobile showed Americans that we have been paying for phones/services the wrong way all these time. Cincinnati will be covered by the new spectrum T-Mobile bought from Verizon. Expect nice changes in the coming months. They said they will rollout in a few markets by the end of the year. Most of the cities will have to wait until TV channel 51 is shutdown after the 600MHz auction, most likely two years from now. You will also need to buy a new phone to use LTE on the new spectrum. Levin emphasized that it was mainly people on EIP that had a low churn rate. Whether it is an EIP balance or an ETF, customers face a financial deterrent to leaving T-Mobile now, just as it is for any carrier. They could just sell their phone and pay the rest of what they owe. See, while I agree with your comment, I must add that this isn’t any kind of penalty. This is requiring you to finish paying off what you bought with T-Mobile’s money. If anyone would like to avoid that, they can just buy their phone outright instead of doing 0% interest payments. No phones in this industry will come at less than their full cost, unless they’re used. Things like contracts and EIPs make sure people have options other than paying for the entire cost of the phone upfront. The problem is that a contract is bound by the terms, and the company will always win. With the EIP you have the option to pay it off early and shorten the term, thus reducing your monthly payment. The consumer can ultimately decide what option works best for them. I personally love the EIP method partnered with JUMP!. In the end, I can see people complaining about needing to pay a fee to leave a contract, but there should be no reason why you feel that you shouldn’t have to pay for the phone you bought on someone else’s dime. But, yes, it can be a financial deterrent. I do agree there. Is Cincinnati Bell any good? I am kind of fascinated they’re still an independent entity. I have friends that have them and they are fine with the service, as long as it’s in town. I totally agree about the limited spectrum here. I recently made the mistake of buying an unlocked at&t phone assuming that most of the spectrum would be refarmed to pcs. I was essentially forced to switch to straight Talk (AT&T) in order not to have 2g data almost every where around me. Next time I upgrade my phone I am definitely coming back to T-mobile again. Beware anyone that has the same idea that I had! Well I knew that it didn’t support those bands, I just wanted to try it out. Well that was entirely your stupid mistake. And I take full responsibility. In fact, the network modernization program is based upon migrating some HSPA+ service off AWS (1700/2100) onto PCS (1900) to create room for LTE. The original target was for it to happen on 37,000 cell sites out of the ~52,000 that are used to deliver the TM network. Given that LTE has reached markets covering 209 million people (92% of the total population who had access to HSPA+ on AWS), it is very likely that they have completed the work on over 30,000 of those cell sites, which would mean that almost 60% (at least) of all their towers should support faster services on the PCS band. cant you trade that phone in? Yeah in that market Cincinnati Bell holds the spectrum T-Mobile would need to roll out LTE there. Maybe they should make a deal with them. So, I was thinking…. I may end up keeping my Note 2 because I think I would miss the extra screen size even though it’s not much more than the Z1s. I personally wouldn’t mind getting a Note 3 but then it’s not much different than the Note 2. I pay $24 a month on my Note 2 and noticed that the current price is now only $19 while the Note 3 is $29.50. I thought that maybe I could just use my first jump and upgrade it to another Note 2 so I could save the extra money every month and by the time my second jump is available, get the Note 4. Then I thought about how if I did just get another Note 2 I would still need to pay the taxes on it which really wouldn’t save me anything at all. Oh well it was a thought, too bad the Note 3 didn’t come down to what I am currently paying now on my Note 2, then I probably would jump. Hmm the xperia z1s is looking really good. I might get it next month when im available to jump on feb if i dnt cancel t-mobile i might get it. It does seem like a nice phone. 32gb of internal memory, a killer camera, waterproof, and 20×20 LTE capabilities… I may just have to go into a store to check it out. I used my first Jump opportunity This week. Very Easy to do. The Tmo Sales Rep says i was his first. I left the Nokia 925 To go to The Nexus 5. I called prior to going in and they told me to only bring in the phone. No box or Charger required. I would also like to say, I love my Nexus 5!! Thanks for sharing your experience Jumping, hmm, so no charger, no box. How much did you have to pay for the Nexus 5? Well, Being the device is $0 down right now, Nothing. I only paid the taxes, It was $23.00 to walk out the door (kiosk). I guess if a newer device comes out and its $100 down, then i would be required to pay that. With the Nexus 5, $0 and 16.50/month. Which was cheaper than my $20/ for the Nokia. Glad to see the program in action. I’m eligible for JUMP this month too. But, I’ll wait until TMo has a another high-end Windows Phone before I use it. It works well. Very easy, I had the Nokia 925. It was a okay phone. I had replaced it 3 times in the 6+ months of owning it. Speaker issues, Wireless charging quit working also. I would have stayed with Windows, But i wanted a Pebble Smart Watch and its something they have not ironed out yet. So i went back to Android and the Nexus 5 is a great device. Do you know if the stores have the 32gb Nexus 5? They do not. You “may” be able to order that online. Not sure how the jump would qualify. I had to go to 3 stores just to find one in stock. 16g that is. I’m glad i signed up for the Jump program. Bought the Nokia 925 and owe 487.00 , but i can’t give it away for $200.00 in a private sale so i am jumping to something else and let T-Mobile have the balance of that device. Great phone but like many others it don’t hold the resale value down the road like a Iphone does when you want to sell it on Craigslist or Ebay . It’s a windows phone, it isn’t worth anything. don’t my word for it,unless they have another drop down menu I didn’t see. iPhones have the highest resale value. Androids do not, for a reason. There is also Swappa, which is better than the 3 above. only show about 4or 5 phones they take from Tmo,I did not spend lot of time on that site,I must of have miss that part of the site. I see the same thing happening to a lot of Android phones as well. So it’s not just because it’s a Window phone , moron. No need for name calling. Statistics show that Windows phones are less desirable than Android. All phones are. Just look on ebay see what people are sellng phones for that came out only 2 yrs ago now 3 yrs now. The Amaze,used $130-175. New$200-230. SG2 used $150-200. New I believe $225-275. My Touch 4gslide new $145.So maybe Jump is worth it. ebay,even those it I used,it looks brand new. On ebay,the 925 goes over $200-300. I notice. My galaxy S4 isn’t worth what I owe on it. I’m trading it in with JUMP! in like a week. Android phones are a dime a dozen. They’re the new windows computer. Even more so than Windows Phone is at this point..
Yep , that’s what I’m saying. Pay big money for it then get little in resale value even if it’s only 6 months old . Thank god for the Jump program as many customers will be pissed off without it later as their still paying on a phone that has worthless resale value . Yep , and get a chance to get rid of those phones that don’t hold resale value down the road. Actually releasing manufacturer software updates for your handsets would retain customers as well (especially this customer). I just see JUMP as a further excuse not to support the phones T-Mobile sells locked down. Phone not getting updates anymore because T-Mobile is blocking them? JUMP.